Yes there may be time lag of 10 years in coming of the judgment but it is heartening to note that Maharashtra State Consumer disputes Redressal Commission has agreed that it is the doctor ,who has to decide whether it is emergency or not. It is good that this will not be for TPA’s to decide whether it is emergency or not. “An insurance company’s officials are not experts who can decide whether a particular case is of medical emergency or not, the Maharashtra State Consumer disputes Redressal Commission observed while ordering an insurance company to pay Mediclaim to a Versova resident. It is for the expert doctor in the field to give an opinion if this is case of medical emergency or not, the commission stated in its order. The case dated back to 2000. Shamim Khan was working as a schoolteacher in Jeddah, Saudi Arabia. It was during a visit to India in July 2000 that she suffered unbearable stomach pain that led to severe bleeding. She also experienced breathing problems and her haemoglobin levels began to drop considerably. Khan was admitted to Bombay Hospital immediately where an emergency surgery was conducted. She was discharged after eight days of stay in the hospital and, after incurring a total expenditure of Rs 41,158, Khan lodged a claim for insurance with the New India Assurance Company Limited from whom she had taken a policy. The policy was in force from April 2000 to March 2001. Kahn’s claim was, however, rejected on the ground that there was no emergency need to undergo the operation” Aggrieved by the repudiation letter she filed a complaint in a district consumer forum, where the insurance company argued that “she (Khan) knew of the illness even before she came to India and had purchased the policy by suppressing material facts of her illness”, son it had the right to repudiated the in surer pleaded. Khan had, however, procured a doctor’s certificate to the effect that there was an emergency situation and the doctor was required to operate on her to save her life. Based on this document, the district forum on July 7, 2007, directed the insurance company to pay the medical claim and also Rs 5000 for causing mental harassment to Khan. 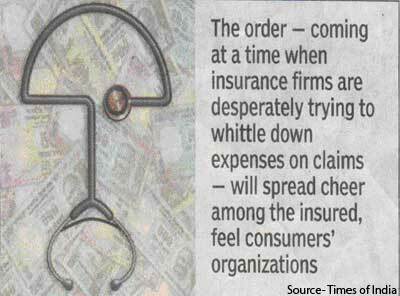 The insurance company then filed an appeal against the order in the state commission. But the state commission agreed with the district forum’s view, saying “doctor’s certificate proved beyond doubt that this was clearly a case of medical emergency”. The commission, while up holding the order of the district forum, added that the insurance company had wrongly repudiated Khan’s claim. The order- coming at a time when insurance firms are desperately trying to whittle down expenses on claims –will spread cheer among the insured, feel consumers; organizations. The name of the insurance company was not mentioned in the news which appeared in a leading newspaper .If you know the name of the insurance company then do let us know. While we respect and appreciate the judgment –it will be better if the fine imposed on such co is higher, because Rs 5000 is a negligible amount for large insurance companies.